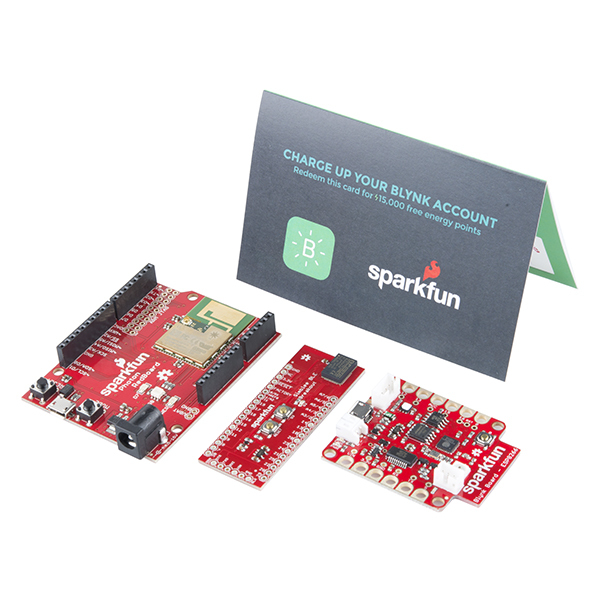 The IoT Bundle is a small kit of three SparkFun Original Internet of Things boards at their lowest combined price ever. Inside each box you will find the SparkFun Blynk Board, SparkFun Photon Redboard, as well as the SparkFun Simblee BLE Breakout. Each board offers unique functionality as they each posses a different chipset (ESP8266, Particle P1, and RFD77101 respectively). This bundle is perfect for those of you looking to get into the world of IoT but can’t decide on which board to start with! This bundle is available for one day only on Almost Free Day. We have priced this bundle at $74.99 so that if you purchase one of the $0.01 random Almost Free Day boards you will qualify for free domestic shipping! When purchased together you get one great little board for only a penny as well as three trusted IoT main boards to play with as well! Note: This product will only be available online while supplies last, as well as sales prices. Customer accounts only â€“ no guests, educators or distributors. No backorders allowed. Only one â€œAlmost Freeâ€ SKU, one IoT Bundle and one Wearables Bundle allowed per order.